Many people assumed that since the Buddha had passed on to Parinibbana more than 2000 years ago, he can no longer hear us or our prayers. But if you have read books from the Thai forest tradition, you will be aware that Buddhas and Arahants of past and present eras do come to guide and teach earnest practitioners. Khun Mae also taught that big and powerful devas will take care of big Buddha statues. When paying respect, make aspirations that may we can always learn the Dhamma, and that there would be less obstruction till we achieve Nibbana. Also dedicate merits to family members and other beings. When doing this, our families and other beings can gain a lot of merits. If you think only about meditating and chanting and the heart is not yet pure, the merit cannot reach other people. But when you give dana to the Buddha (by offering flowers, candles, jossticks) and paying respects, it’s not about the amount but the sincerity that comes from your heart. The merits reaches the recepients and provide a foundation for your practice. All Masters pay respect to Buddha. 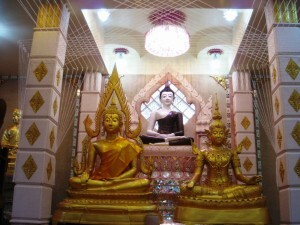 Therefore we also pay respect to the Buddha’s virtues too. When I first known Khun Mae, I was one of those serious meditators who believed in meditation retreats. I was also trying very hard to develop concentration and nearly gave up- my face was constantly serious, and I never wanted to look at anyone. I just went around looking for a quiet place to sit. The type of person that when after coming back from retreats and can still lose the cool when swamped by problems at work. Khun Mae took me to a few temples and explained the above significance of paying homage to Buddha statue. She said practice is not only about sitting on a cushion and forcing the mind to stop wondering (it was only few years later that I finally understood the importance of continuous mindfulness and was able to keep my cool and calm). When the trip was over and on the same day as I came back, my mom had an eye checkup and she found out she had glaucoma. Actually, she did not even know about the checkup- it was her friends that went for a free talk and they thought of suddenly registering my mom for a free checkup. During that free eye checkup, the doctors were shocked at the condition of my mom’s eyes. She actually had very advanced stage of glaucoma (glaucoma is often also known as the silent killer- there are no symptoms- the condition is due to elevated pressure at the eye that presses on the optic nerve. When the optic nerve breaks one day from the pressure, the person will just suddenly grow blind). Eventually my mom sought treatment at the government hospital, well known for its long waiting list. But due the the advance stage of her condition, they immediately scheduled the laser on the following week. The condition had been lurking around undetected for years prior to my mom’s diagnosis. I am grateful that Khun Mae taught me the significance to pray respect to the Buddha. After the transference of merits, her problem was discovered on time and enabling my mom to undergo treatment.